Image optimization for SEO is something that no webmaster or SEO manager should ignore. Appearing in Google’s image search can bring valuable traffic to websites. Fast internet and high-resolution displays are standard in everyday life today. Images and visual content on websites are therefore becoming increasingly important. They present the product to the user, illustrate the content, and break up continuous text. Graphs and diagrams can help to display complex content quickly and easily. An important factor that is often overlooked is how Google Image Search can generate valuable traffic. If you want your pictures and graphics to appear there, you have to take a few things into consideration. Images also have a direct impact on the performance of a website. In this article, we will explain what needs to be considered when optimizing images for SEO. The name of the source file is specified via the src attribute. This specifies the path of the image. This is specified relative to the position of the image on the web page. If images are stored on an external server, its complete address is specified. In general, it is recommended to store images on your own servers so that you can retain full control over the files, and to protect them from unauthorized access. The Alt and Title attributes have two functions. The attributes provide information for screen readers therefore ensuring an accessible website. They are also important for appearing in a Google image search, as they provide the search engine bots with information about the content of the image. 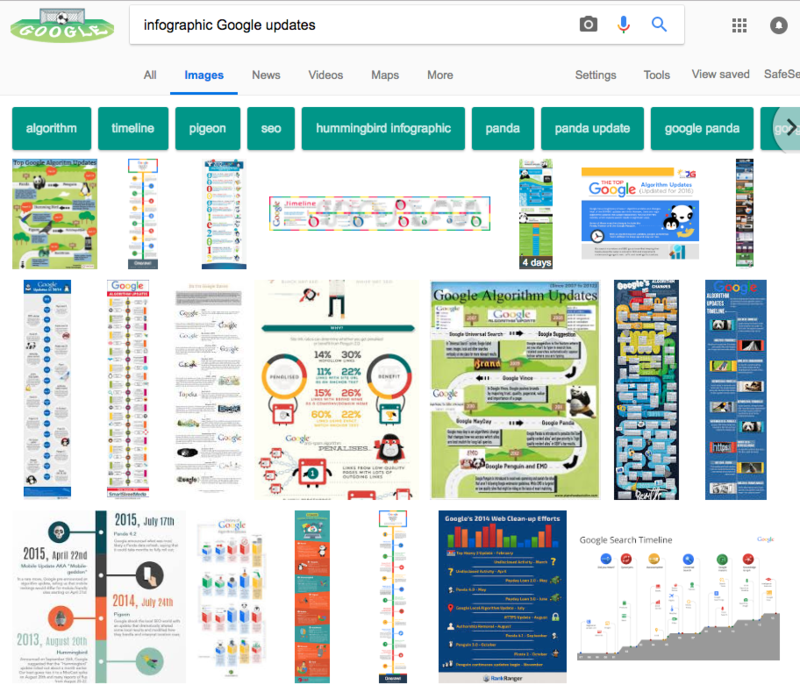 Google strongly recommends using these elements to increase chances of appearing in the image search. These two elements are an important part of image optimization in SEO. When using CMS systems, the folder structure is automatically determined by the respective system. How they are organized will depend upon the settings, for example they might be organized by the upload date. Furthermore, the webmaster only has access to the files, but not to the folder itself. This is no longer a problem, as it is only necessary for the folders to be located above the root directory when retrieved by a browser. Image file protection is more important. It does not protect the files directly, but instead protects the surrounding folders from unauthorized access. This is done by using a htaccess file. It defines the access rights for programs and users. If the file name of the image contains a keyword, there is a better chance that the image will rank well in the image search. The file name should reflect the content of the image. Don’t include too many keywords, as keyword stuffing no longer works for image file names. Choose a neat and consistent file name, as this facilitates the organization of the images. It is also important to use the keywords in the Alt and Title tags to show search engines the connection between the text and the pictures. The search engines are designed to recognize this, and they can easily match the image and their contents with appropriate text passages. This benefits not only the search engine, but also the user experience. How exactly image optimization should be performed in SEO also depends on the type of image file being used. They are available in different sizes and file formats. Modern browsers can display many file formats. In recent years, several file formats have established themselves as standard. However, this development is not stagnating either. The JPEG format is the classic image file format. This format dates back to 1992. Like other formats, such as PNG or GIF, it belongs to the category of bitmap graphics. The individual pixels of an image are arranged in a grid and follow a fixed structure. JPEG images are versatile and are particularly suitable for colorful and high-contrast color photos. Like the JPEG format, PNG is a bitmap graphic. It dates back to 1994 and was developed as an alternative to the GIF format. At that time this was protected by a patent. The file format is available in two variants: PNG8 and PNG24. The PNG8 format can only display 256 colors. The PNG24 format has 16.7 million colors, just like JPEG. The main difference between PNG and JPEG is the ability to display transparent areas. PNG files can also be compressed without a loss in quality, which is not possible with the JPEG format. However, this also increases the size of the image files. They are suitable for displaying logos or texts. The biggest and most important difference between SVG versus JPEG and PNG is the type of file format. SVG files are vector graphics, and SVG stands for Scalable Vector Graphics. The format dates back to the development of W3C in 2001. The format is based on the markup language XML. It is therefore possible to integrate SVG files directly into the HTML code of a web page. The browser then loads the graphics directly and without a file from the server, unlike with JPEG or PNG. This has a positive effect on the loading times of the website, as fewer requests have to be exchanged between the browser and server. SVG files can also be scaled without loss. This is not possible with JPEG or PNG files. That means SVG files are particularly suitable for logos or graphics. Direct integration in the HTML code also has a disadvantage. SVG files are not considered to be very secure. The format has inherent security holes which can, for example, be infiltrated by malicious scripts. These can adversely affect the performance of a website and therefore create a poor user experience. As a result, user signals relevant to ranking can deteriorate. The size of the image file also plays a role in the performance of the website. Image optimization in SEO does not consist only of correctly naming and maintaining the tags. The resolution of the file is also important, because it directly determines the size of the file. A larger file requires more resources, both on the server and when loading the file. It is therefore important to keep the files as small as possible and as large as necessary, because pixelated or blurred images are just as unattractive to the user as long loading times. It makes little sense to insert a file with an edge length of 1000 pixels into an element whose edge length is only 500 pixels. However, the images should not be saved too small. Files that are too small and on which the user does not recognize the content will also not make a good contribution to traffic and ranking. After all, user signals also play a role in rankings in the image search. If the user does not see anything on the picture or only very little, they will just leave the page. This applies particularly to image searches. Small thumbnails or blurred images are unlikely to generate traffic with the second click within the image search. The pure file size is particularly important for mobile SEO and the increased use of smartphones. Smartphone users are usually impatient and leave the website quickly if loading times are too long. The optimization of images and especially their file size can quickly lead to better performance. The importance of this fact is also shown by the introduction of mobile page speed as a ranking factor starting in the middle of this year. PNG, JPEG or the SVG are the established image file formats. Nevertheless, the development of image file formats is still continuing. The JPEG 2000 and JPEG XR formats, for example, are further developments of the original JPEG format. They offer the same quality despite having a smaller file size. In addition, the JPEG XR format supports transparency just like the PNG format. In addition to these further developments, new file formats are also being developed. The main goal is to keep the file size small without compromising quality. Current developments include the formats FLIF (Free Lossless Image Format) and HEIF (High Efficiency Image File). A problem in this context is that as of now, there is hardly any existing support by the known browsers. Tools such as Can I use can be used to check the compatibility of different file formats with various browsers. These two attributes are the most important elements for content image optimization in SEO. They provide the search engines with the necessary information and references to make the content of the images accessible. Finally, the image search is still text-based, i.e. based on the information from file name, title tag and alt attribute, the search engine captures the content of an image. Therefore, the maintenance of these tags is still very important. How title tags and alt attributes are optimally maintained and used is shown in our instructions for image SEO. Google’s Cloud Vision API shows how important correctly marked metadata is. Here you can see how much information can already be read from images. If metadata and recognized content conflict, this can have negative effects on the ranking of the images. Equally important is the suitable placement of an image in the continuous text. Google recognizes the connection between the content of the image via the tags and the surrounding continuous text. Therefore, the images or graphics should be placed in the appropriate places in the continuous text. In an ideal case, the keyword will also appear in the text. In this way, the factual relationship between text and image is also made clear for the Google Crawler. Of course, the current best practices for content creation must be observed. If the image or graphic is close to a headline, the reference is once again reinforced. In addition, the text is enhanced by appropriate placement. The user receives a visual representation of the contents of the text or the paragraph in an appropriate place. The EXIF data is metadata that is automatically created by the camera. For example, it contains information about the camera model or the camera settings. Data such as GPS position or date can also be included. More important, however, is information about the copyright and originator. These can be added with the right kind of software. However, the role of this data in image optimization for SEO is very small, as this video by Matt Cutts shows. EXIF data can be read by Google, but is no longer displayed in the search results. It is also not known whether this data is relevant for the ranking. EXIF data should not be deleted once it exists. However, it is not a disadvantage if it is not specified. Therefore, the use of additional EXIF data is more of a tool to locate the origin and the original creator of an image. This can pay off with self-created images and graphics. The way Google’s image search works is very similar to the normal web search. For images, the information is extracted from the tags mentioned. The ranking of the image search consists of this information and the relevance of the website. The optimization according to the mentioned criteria increases chances of appearing in the Google image search and the ability to use this as a source of traffic. The recent changes made to Google Image Search to support copyrights reinforce this effect. Thus, it is no longer possible to download images protected by license without further authorization. A user/designer must now visit the original website of an image. If, for example, commercial photos are offered on the website, this can be a great help in increasing the number of visitors. Image search can also be an important source of traffic for online shops. Especially in Universal Search, OneBox is very important for images. If your own images are displayed in the OneBox, traffic can be increased beyond the actual image search. Prerequisites for this are consistently optimized and suitably placed images on your website. In addition, technically optimized images contribute to performance and user experience. Loading times are optimized and improved. Attractive images and graphics support sales arguments and general statements in continuous texts. For a visually appealing website, good and appropriate pictures are indispensable. The biggest buzzword in connection with image optimization in SEO is Visual Search. An image search based on the image information and no longer on text-based information. The project Google Lens on Android smartphones shows the possibilities of visual search. The above-mentioned Cloud Vision API also shows what is already possible in terms of visual search with the help of machine learning. In addition, modern smartphones, tablets and desktop computers are equipped with high-resolution displays. Resolutions in the range of 4K are now standard. These pose new challenges for technical image optimization in SEO. The challenge lies in the size of the files. A retina-capable file has at least twice, and ideally three to four times, the resolution of the actual file. These high resolutions result in larger files. As a result, more storage space is needed and loading times will increase. It is no longer a matter of megabytes, but of a few hundred kilobytes. This can have a significant impact on performance. Once again, the image files should be as large as necessary and as small as possible. The development of the above-mentioned file formats, FLIF and HEIF, already takes this into account. Image optimization for SEO is an important component of modern search engine optimization, in terms of content using tags and technically with regards to file size and format. In addition to image search, the content is also used to better understand and interpret the content of the surrounding texts. The maintenance of the alt tags, title tags, as well as the correct resolution and the associated file size, is also very important. The effort pays off in the end with better performance and increasing traffic. While the latest changes to Google Image Search may not benefit webmasters and image search traffic, image optimization should not be ignored. However, more clicks are needed to get from the image search to a specific website. This traffic is more relevant, as users are more likely to want to get more specific information by going deeper into the conversion funnel.